via the form on the Contact page of this website. Some people don't care for storms, but they fill me with energy and often lure me into braving the elements to head oceanside, even in the dead of winter. There's something about the immensity of the ocean and the untamed surf that draws one. I think somehow it puts the rest of life into perspective. No matter what challenges confront, they seem insignificant when faced with the power of the sea. And in the scheme of things perhaps they are. 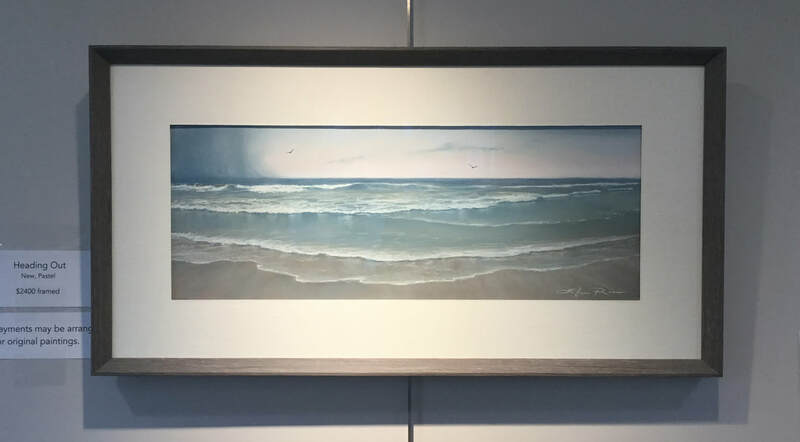 In my pastel painting Heading Out, a summer rain squall heads out to sea, leaving dark wet sand behind and swell after swell rhythmically dancing ashore. The squall to the northeast draws the eye. While standing safely on the shore, one can only imagine being caught up in it far out to sea. As dawn breaks, gulls leave their huddled groups on the water's edge for winged pursuit of breakfast and normal life returns. There are munchable fish and sand fleas on the menu, and all is well with the world.